Wow! 2015 is already in the second quarter of the year. I've spend the first three months of the year, trying out many systems and ways to make life more meaningful this year. One of the things I want to create this year is to making memories and cultivate a good life. None of these things can happened without the tools to capture the memory. Right from the start I knew that 2015 is going to be hard for me because the most important person in my life is no longer with me. It feels like I've lost a part of me. Coming back from that is so difficult than I thought. Memory keeping is one of the legacy that I got from my mother. I used to treat memory keeping as an afterthought, never really plan or think about it. But after the death of my mom, I often wish that I have took the effort to really record and document the important things. I've begin to forget what she feels like, what she smells like and deep down that's scared me. 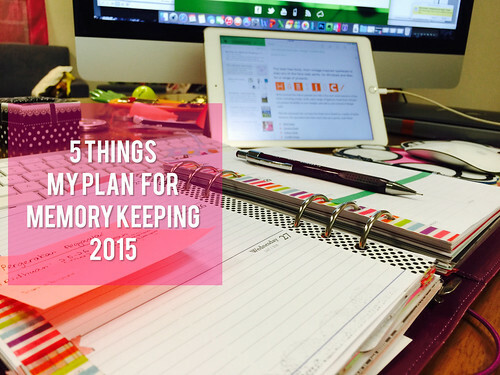 When I read Ali Edward's blog about her plan for memory keeping in 2015, I felt inspired to make my own plan for memory keeping in 2015. So this year I am making it my mission to take memory keeping to the next level which is to use every available tool at my disposal to document my life. I knew from the beginning that I will keep doing Project Life app and project life system this year. I am not going to stop there. - Ever since I bought a smart phone four years ago, I have been using it as my go to camera. I love taking pictures with my phone. It's light and it's there. So this year I plan to use my phone to capture almost anything like daily photos, scan papers and receipt, scan my mom's recepies book and scan some of old photos. I also plan to take photos other than selfies. I need to involved things and places more this year. All of these photos will either be send to flickr or Evernote for reference. I will also be using some of these photos in my planner and journal by printing them out and paste them in my journal. Ever since I got hung up and obsess with planner in February, I realized that I can use my planner to captured bits and pieces of what's happening and things I have to do through out the year. It's already organise chronologically with dates, times and months. I will definitely put my planner to a good use this year. - I have been obsess with watching Hobonichi, Journal, Doodling on youtube lately, I have been so inspired to journal every single day. I have a lot of notebooks that I've collected through out the years. I am going to use these book as my free flow journal, where everything goes. Write without editing myself. Draw and doodle to my hearts content. I just can't describe how wonderful it is to hold a pen in your hand and just write on a paper. - 30 days of lists is a semi annual project that I've participate for over two years and I love it. This project helps me to document my life in lists. I love lists and I love looking back at my lists and look at what I wrote back then. This year I planned to join in the fun of doing lists. On top of 30 days of lists, I also join The Reset Girl #listersgottalist challenge. I love the prompts and I love writing lists. Somehow these projects help me to think and focus more about the important things in my life right here, right now. - I have been a user of Evernote since two years ago. I love using Evernote in the begining but after awhile I seems to use this app less and less. This year I found out that Evernote app has evolved and changed a lot. I like the user interface on the phone and on the Mac so much that I decided to come back to it. I have totally revamp my notebooks and keeping it as simple as possible. I plan to use Evernote for memory keeping like keeping an online journal, inventory of my purchased kits this year and the year before, as a place to keep all my receipts, archives conversation from whatsapp and bits and pieces from my sosial media. Come to think of it, I might use Evernote to backup all my non digital media like Planner, Journal and my lists. My intention is this year is to keep as much as possible about things that happened in my life, document them and find a pleasant way to preserve it and showcase it for the whole family to enjoy. Create the life that I love and record it!